With our move only weeks away now, I have to onerous task tomorrow of calling around and informing credit cards, banks, utility companies etc, etc, etc of our new address. I wish that there was a nicer way to do this - someway that did not involve hours of time on hold waiting for someone to answer my call, and then having me spell out every single word using my own imaginative phonetic alphabet: A for Argyle Socks; B for Bread Pudding; C for Curling Ribbon. Imagine if you could just send all the companies involved a kicky little card to inform them that you were moving on, please update your files. Imagine if there was actually someone at these companies who opened mail and actually cared. Well, there I go again with my grandiose dreams! Let's take a look at some cute little moving announcements anyway. 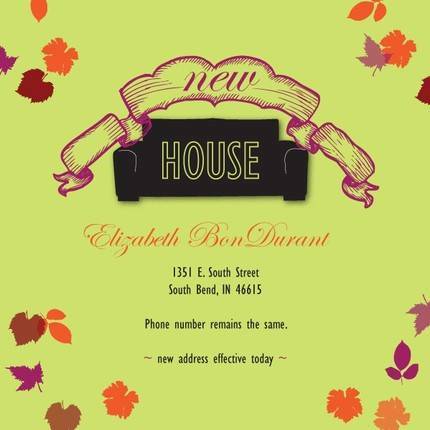 This sweet card comes as a digital file from the shop of mailboxbliss. 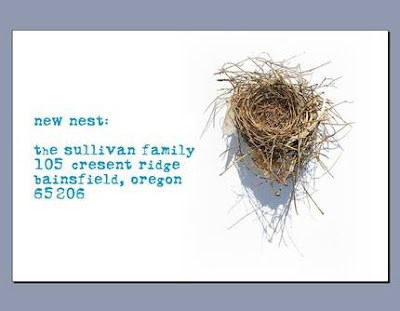 I love the simple, unlcuttered design and the whimsical illustration of the nest. The addition of the shadow below the nest adds a fabulous 3-dimensional element to it as well, which I really love. This sweet, sunny yellow card is totally my style. 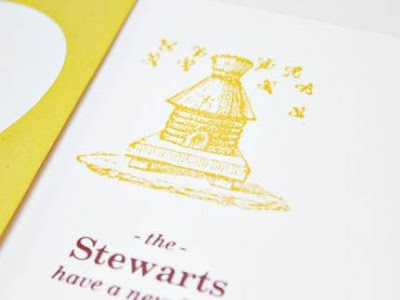 I adore a good bee motif, and the mixture of honey yellow and chocolate brown is utterly delicious. These cards come with matching envelopes, and matching mailing labels. Fantastic! Find these beauties in the shop of WhiskerGraphics.